Good evening, everyone! We had a great Spirit Week last week coming back from Spring Break, and a fun, exciting, and successful PTA Fundraiser at the Faculty Basketball Game on Thursday night! Thank you to all of the families who attended, to the teachers who played in the game, and to our parent volunteers who made it happen! It was a great event. It's the last week of 3rd quarter, and then just 2 short months to go until summer. This past week, in ER-8, we reminded students to stay focused and finish strong as we head into the final quarter of the year. Register your student for FCPS VIP Summer Camp!! 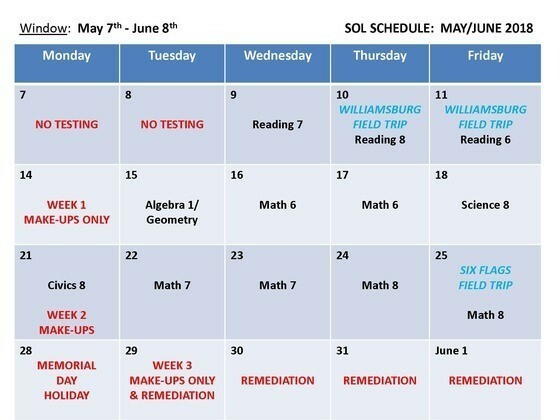 *NOTE: Students can always find the blue-white calendar in their agendas or on the website HERE. For any questions you have about the After School Program, please contact German Cabezas at gdcabezas@fcps.edu. All 6th graders will be visiting Washington DC on Tuesday, April 24th, and Wednesday, April 25th. All permission slips are due to your student's Social Studies teacher by Monday, April 9th. If you would be interested in being a parent chaperone, please contact Ms. Lynette Faight at lmfaight@fcps.edu. Each year our nation designates April as the Month of the Military Child to recognize and thank children from military families for the contributions and sacrifices they make living the military lifestyle. The recognition is part of the legacy of former Defense Secretary Casper Weinberger who established the commemoration in 1986. During the month, one day is selected as the day to “Purple Up! For Military Kids” and all are encouraged to wear purple in recognition of the strength of military connected youth (MCY). Why purple? Purple is the color that symbolizes all branches of the military as it is the combination of Army green, Coast Guard blue, Air Force blue, Marine red, and Navy blue. This year Purple Up day will be celebrated on April 13, 2018. In observation of the Month of the Military Child (MOMC), FCPS is encouraging schools to take the time to celebrate and honor our military connected youth (MCY). A fillable certificateis available to award to MCY. Additional resources, ideas, and materials to help schools celebrate are available on the FCPS intranet site. Check the Healthy Minds blog throughout the month for more ideas and information. The School Board will recognize April as the Month of the Military Child at the April 12, 2018, School Board meeting beginning at 7:00 p.m. at Luther Jackson MS. All military connected youth and their families and school staff supporting them are invited to attend. FCPS will hold the 13th annual Special Education Conference on Saturday, April 21, from 8 a.m. to 3 p.m. at Hayfield Secondary School. The conference, designed for parents and educators of students who receive special education services or who have learning challenges or special needs, will feature Dr. Pamela Mims, associate professor of special education and associate dean of research and grants in the College of Education at East Tennessee University, as the keynote speaker. Mims’ keynote topic is Using Evidence to Guide Practice: Justifying Inclusion for All. In addition, this year there will be more than 60 breakout sessions to choose from. Get more information about the 2018 Special Education Conference and register for workshop sessions. 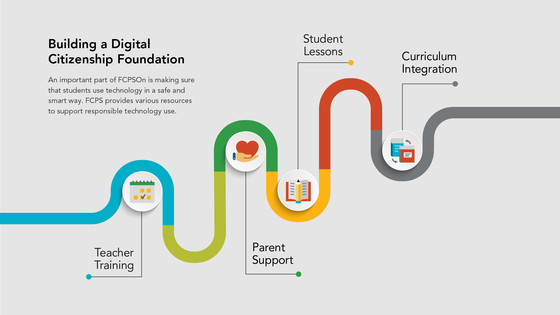 FCPS is on a journey to enhance learning through FCPSOn, a 1-to-1 digital transformation. The term 1:1 means each student will have access to one device to use for learning. Holmes will be beginning this journey next year by going 1-to-1 with all 8th graders. FCPSOn extends student learning and increases equitable access to technology and instructional practices that lead to personalized, meaningful learning experiences which provide opportunities for deeper understanding and development of Portrait of a Graduate attributes. The FCPS Strategic Plan Ignite includes access to contemporary and effective technology as a component of the Student Success goal. Students will have access to the device at school, and in some schools and grade levels, students will also be able to take their device home. A plan has been developed to engage community stakeholders on the next phase of FCPSOn. This plan involves regional as well as school-based community engagement. Five community meetings (one in each region) are scheduled in March and April to explain how FCPSOn supports the division’s Portrait of a Graduate and Ignite goals. 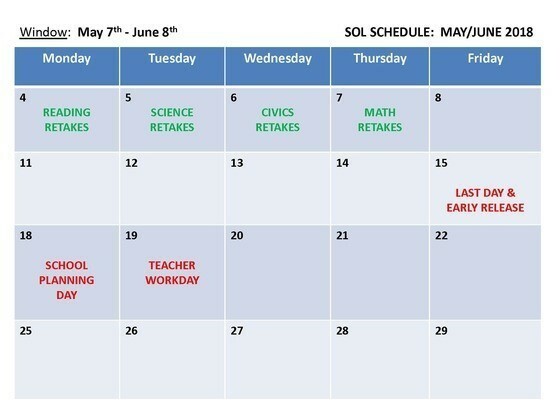 In 2018-19, school-based community engagement will begin for schools scheduled to implement FCPSOn during SY 2019-20. These school-based engagement activities will help stakeholders develop a deeper understanding of FCPSOn and the instructional practices that will be implemented when 1:1 technology is deployed in their local schools. Learn more about FCPSOn and how it supports the Portrait of a Graduate and Ignite Strategic Plan goals by attending one of five community meetings. All meetings will begin at 7 p.m. To request an interpreter, please click on Interpreter Request Form. 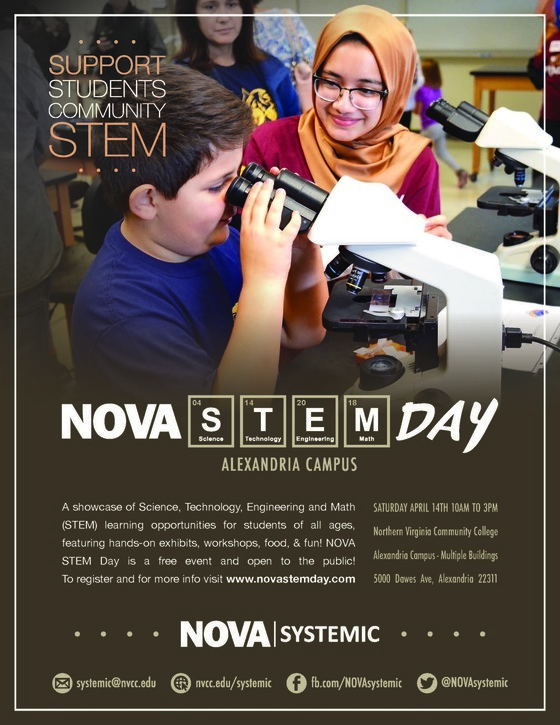 The second annual NOVA STEM Day (www.novastemday.com) will be held at the Alexandria Campus on Saturday, April 14, 2018 from 10am to 3pm. NOVA STEM Day is a free public festival celebrating STEM. They expect to have mostly elementary and middle school aged attendees with their families, but also hopefully some older ones as well. Fairfax County Public Schools is partnering with Northern Virginia Community College to offer more than a dozen one-week STEM (science, technology, engineering, and math) summer camps during the summer break. Open to students currently enrolled in grades 3-12, these one-week camps emphasize hands-on learning, teamwork, critical thinking, and career awareness in a fun and engaging way. Topics include robotics, coding, forensics, cybersecurity, app design, aviation, and pre-health. Camps will run June 18 through August 3 at the following locations: Edison High School, Marshall High School, Westfield High School, and Hughes Middle School. 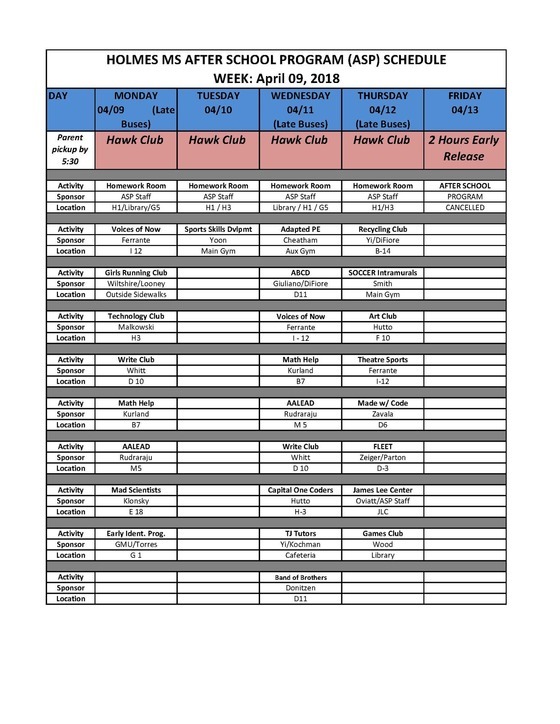 Discounts are available to parents who sign up their child for multiple camps or sign up multiple children. Additional information and registration is available online or by contacting STEM Outreach Coordinator Charles Britt at cbritt@nvcc.edu or 703-425-5917. Like you, we believe your child is a Very Important Person and deserves a summer experience that is safe and full of fitness, friends, fun and enrichment. FCPS and Fairfax County Department of Neighborhood and Community Services (DNCS) have teamed up to offer a 5 week camp for rising 7th and 8th graders. Our camp will be a combination of students from the following middle schools: Glasgow, Holmes, Jackson, Kilmer, Poe, and Thoreau. Bus transportation will be provided from various pick-up locations which will be communicated in June prior to the start of camp. There is a $50 registration fee. We will take weekly field trips and pricing information for that will be released after we have notified students of acceptance. Students who do not attend the field trips will not need to pay the field trip fees, but will need to stay home from camp that day as all of our staff will attend the trip. Students will also have the option of choosing which trips to attend. The staff is led by your local After-School Specialists and trained DNCS staff. Campers will have a great time playing sports, games, doing arts and crafts and exploring concepts in science and technology. With limited spaces available, it’s important to submit your registration as soon as possible. Questions? Contact Shannon Campbell at SLCampbell@fcps.edu or 703-846-8089. 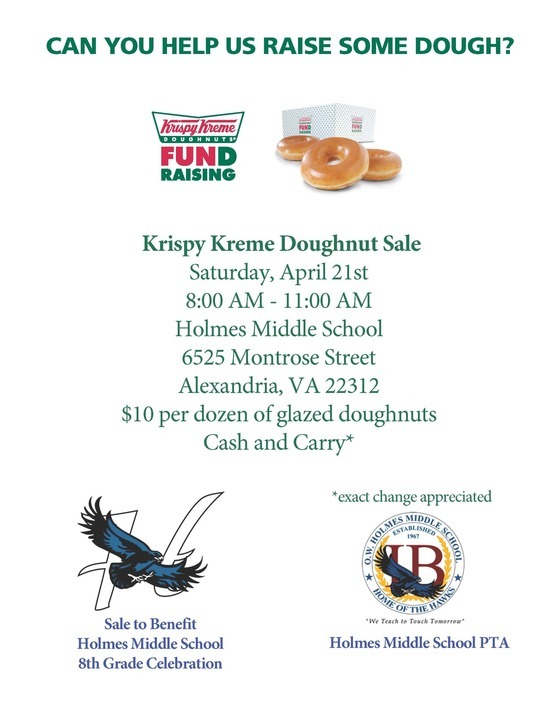 Fundraiser for 8th Grade Celebration!